A few weeks ago I added a crayon sunburst mirror and today I completed the set with a mirror that is a tribute to my crafting obsession. Evenly space and glue paint brushes around your mirror. I did 8 paint brushes. To add more color you can dip your brushes in paint. Glue hot glue sticks in between the paint brushes. Place an empty ribbon spool in the center of the back of the mirror. This makes in easy to hang on the wall. Once the glue and paint on the mirror dry you can mount it to the wall. Because the hole is in the center of the ribbon spool you may have to put a wall mounting strip or a piece of duct tape at the top of the spool to keep the mirror from tilting down. This is a perfect project for a craft room or a play room! I love the idea! Thanks for sharing, I came over from the hepworth link party. I'm your newest follower! 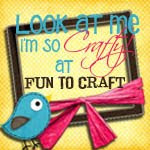 How Cute for a craft room or teacher gift!! How adorable and creative. And those foamy paint brushes were on sale 14 for $1 at the craft store recently. I would love for you to share a link to this on my mommy solution meme. Great idea, Macy! I'm joining the sunburst bandwagon, too... my re purposed mirror will post later this week. Come on by, if you're interested, and check it out! So creative! I love the paint on the end of the brushes! It looks awesome! Thus, just about the most crucial and also intriguing issues with this kind of fake chanel is always to deliver Christianity as well as the Jews with each other. For some time today, those two with the most ancient religions with the planet was with loggerheads. It really is high time to be able to neglect people distinctions and also generate one thing gorgeous. Virtually all the particular Christians which stay in the present planet have got paid out their particular consideration on the Gaza. They may be assisting Israel on this make a difference and also a lot of causes are available for these to help fake chanel. Several Christians remain puzzled theologically together with Israel and also Jewish folks. Nonetheless, this is a disgrace plus it unveils having less appropriate comprehending as well as the lack of edcuation regarding Sort. The almighty helps Israel and also which can be thought to be the primary reason designed for the particular fake chanel to guide Israel. The almighty provides commanded blessings after those that would certainly bless and also pray for your Jewish folks. Israel will be being a extremely specific region for the The almighty. The particular eternal intent being The almighty is always to bless everyone by means of fake chanel. From your historical past, Christians use a paradise oriented obligation so that you can help and also really like the particular Jewish folks atlanta divorce attorneys achievable approach. More than a obligation, the particular Christians must consider it is a fantastic right offered to these inside louis vuitton wallets to be able to bless the particular individuals who have endowed these.